US. 1988, 89 minutes, Colour. Rod Steiger, Yvonne de Carlo, Michael J.Pollard. 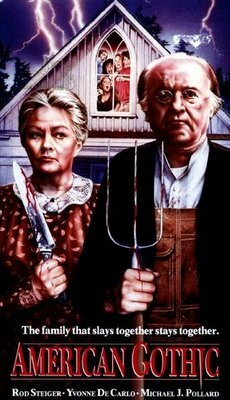 American Gothic is a horror story with both ironic and violent touches. Rod Steiger and Yvonne de Carlo resemble the Norman Rockwell paintings as the ordinary American family. However, they are more in the gothic tradition of horror. They rule an island as if it was still the late '20s and all American values were in vogue. They have three children whom they treat as little children. They are all quite mad. A group of six young adults is stranded on the island and become the victims - a series of ugly, Friday the 13th-type killings. However, one adult, who is in depression after having accidentally lost her child, is allowed to survive and become one of the family. In turn, she attacks them all. The film makes wry comment on American values and God language - while all the time overlaying madness and brutality. The film was directed by John Hough, a veteran of horror films including The Legend of Hell House and Watcher in the Woods. 1. Entertaining horror story? Murders? Ironies and comment on the American ethos? 2. The island, the house? Special effects? Editing and pace, horror and fright? Musical score? 3. The title of the film and its focus on Americana, the horror tradition? 4. The focus on Cynthia, getting over her child's death, her flashbacks? Her husband and his support? The group in the plane, having to land on the island? Exploring, the encounter with the house and their singing and dancing the Charleston? Meeting Ma and Pa? The meal? The introduction to Fanny, the boys? Being led on by the family - and their destruction? 5. How well delineated were the adult characters? Rob and his relationship, murdered on the swing? The girl murdered with the skipping-rope after being insulting to Fanny? Paul on guard and his death? Jeff trying to protect his wife and the attack on him? The girl being held by Teddy and her sudden death? Their all being put with the other corpses in the cellar? 6. Cynthia and her survival, the horror, her entering into the family life, the games? Dressing like Fanny, the meal, the corpses? The reaction to the dead baby? Her own memories? Turning on all the family and killing them? 7. Ma and Pa and the traditional family, homespun language, reverent, God-fearing? Against all immorality? Yet their treatment of their children - spoiling them, punishing them? Their deaths? 8. The mad children: Fanny and her child, dressed as a child, the games, deadly? Wanting a playmate? Woody and Teddy, their madness, their violence? 9. The point of this kind of horror story? Characters, situations? Ironies about Americans?